Northampton Town Festival are tremendously excited to be adding Close Encounter Kites to the entertainment line-up for the 2017 festival to be held at the Northampton Racecourse on the 1st & 2nd July. 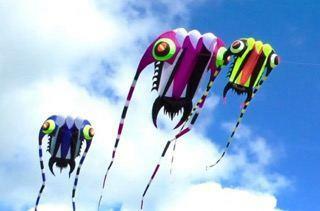 Close Encounter Kites was founded by husband and wife team Allan and Marilyn Pothecary. Flying since 1993, then in dual line pairs since 1996 and in competitions since 2002. Having retired from kite competitions, the couple now enjoy coaching and developing their wonderful displays and can be found at their favourite flying sites on Salisbury Plain, Hayling Island, Calshot Spit or on the peripheries of kite festivals. They fly their amazing kites all over the world. The kites have to be seen to be believed. From animals to witches, crazy tails to stacked limbo kites, Close Encounters put on a display to dazzle even the most hard to please crowd! The kites are stunning; colourful, graceful and fast when in full flight! We’ll let the pictures do the talking but watch this page for more festival information please check out http://www.northamptontownfestival.com/ we’re updating most days now! Wonderful webbsida du har här. RJMQOZ There is perceptibly a bundle to identify about this. I feel you made certain nice points in features also. 6B1tn2 You have made some good points there. I checked on the internet for additional information about the issue and found most individuals will go along with your views on this web site. Muu8zD You have made some really good points there. I looked on the net for more information about the issue and found most people will go along with your views on this site. I just want to tell you that I am all new to blogs and certainly loved this page. Most likely I’m planning to bookmark your site . You absolutely come with beneficial posts. With thanks for sharing your webpage.